Following yesterday’s post, here’s a nice visualisation of how much (and indeed how little) of the Universe the latest galaxy surveys have mapped. In this animation the Earth is at the centre, and the dots represent observed galaxies, with distances are estimated using redshifts Every blue dot in the animation is a galaxy measured by the Dark Energy Survey. Gold dots are galaxies in the DES supernova fields (measured by OzDES) and red dots are from the Sloan Digital Sky Survey. The dark space in between the surveys is yet to be mapped…. Weak gravitational lensing allows one to reconstruct the spatial distribution of the projected mass density across the sky. These “mass maps” provide a powerful tool for studying cosmology as they probe both luminous and dark matter. 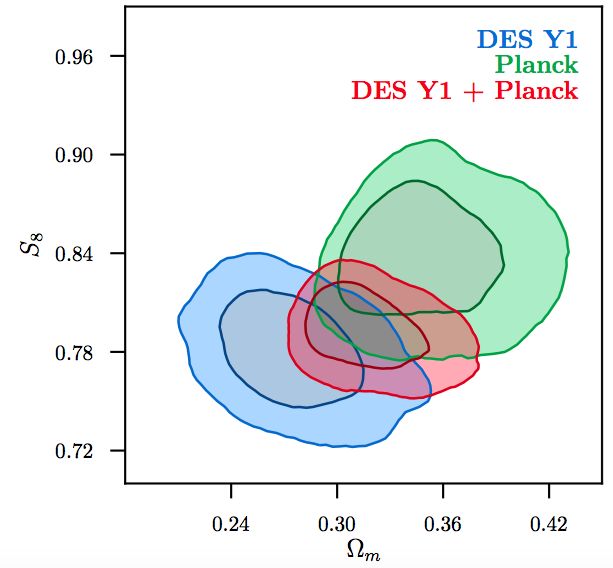 In this paper, we present a weak lensing mass map reconstructed from shear measurements in a 139 deg^2 area from the Dark Energy Survey (DES) Science Verification (SV) data overlapping with the South Pole Telescope survey. We compare the distribution of mass with that of the foreground distribution of galaxies and clusters. 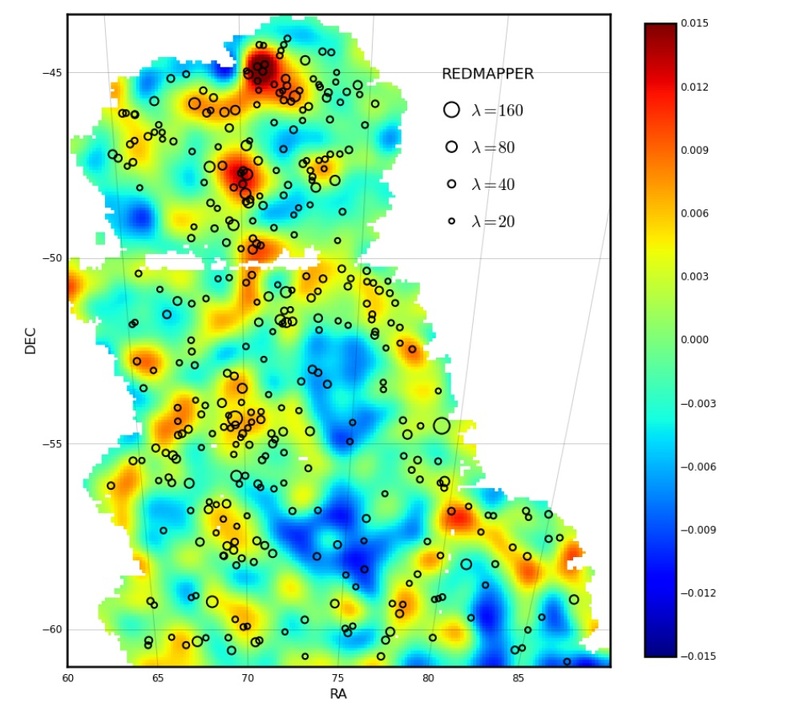 The overdensities in the reconstructed map correlate well with the distribution of optically detected clusters. Cross-correlating the mass map with the foreground galaxies from the same DES SV data gives results consistent with mock catalogs that include the primary sources of statistical uncertainties in the galaxy, lensing, and photo-z catalogs. The statistical significance of the cross-correlation is at the 6.8 sigma level with 20 arcminute smoothing. A major goal of this study is to investigate systematic effects arising from a variety of sources, including PSF and photo-z uncertainties. We make maps derived from twenty variables that may characterize systematics and find the principal components. We find that the contribution of systematics to the lensing mass maps is generally within measurement uncertainties. We test and validate our results with mock catalogs from N-body simulations. In this work, we analyze less than 3% of the final area that will be mapped by the DES; the tools and analysis techniques developed in this paper can be applied to forthcoming larger datasets from the survey. This is by no means a final result from the Dark Energy Survey, as it was basically put together in order to test the telescope, but it is interesting from the point of view that it represents a kind of proof of concept. 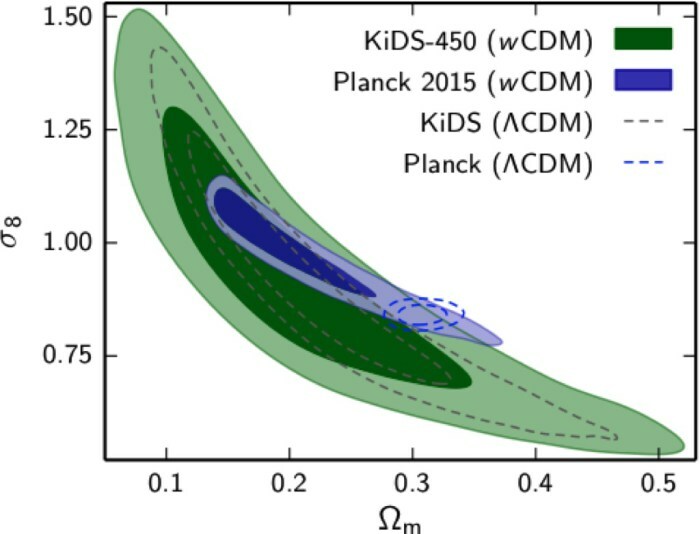 Here is one of the key figures from the paper which shows a reconstruction of the mass distribution of the Universe (dominated by dark matter) obtained indirectly by the Dark Energy Survey using distortions of galaxy images produced by gravitational lensing by foreground objects, onto which the positions of large galaxy clusters seen in direct observations have been plotted. 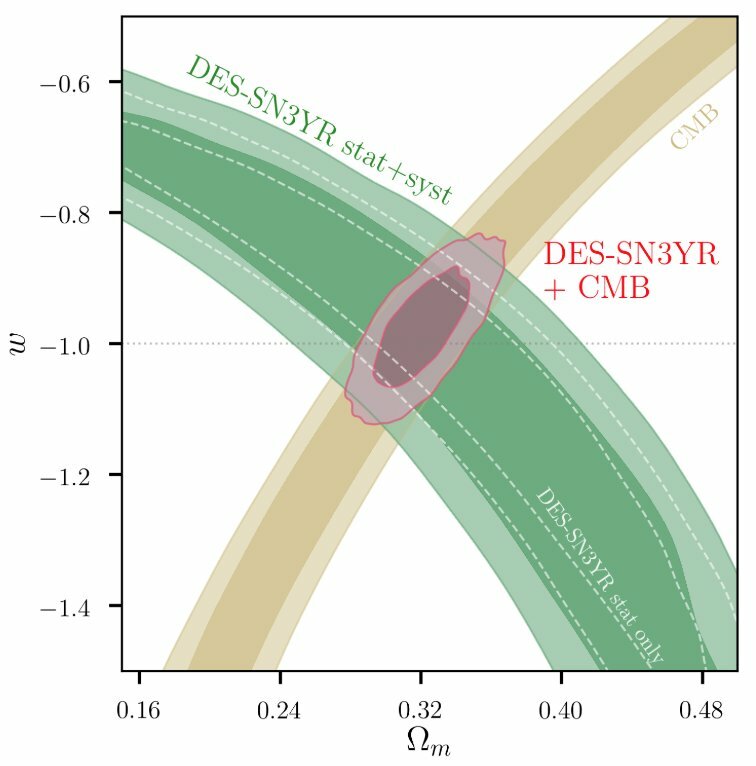 Although this is just a small part of the planned DES study (it covers only 0.4% of the sky) it does seem to indicate that the strong concentrations of dark matter (red) do corrrelate with the positions of concentrations of galaxy clusters. It all seems to work, so hopefully we can look forward to lots of interesting science results in future! As promised yesterday, here’s a copy of the slides I used for my talk to the ~150 participants of the collaboration meeting of the Dark Energy Survey that’s going on here this week at Sussex. The title is a reaction to a statement I heard that recent developments in cosmology, especially from Planck, have established that we live in a “Maximally Boring Universe”. 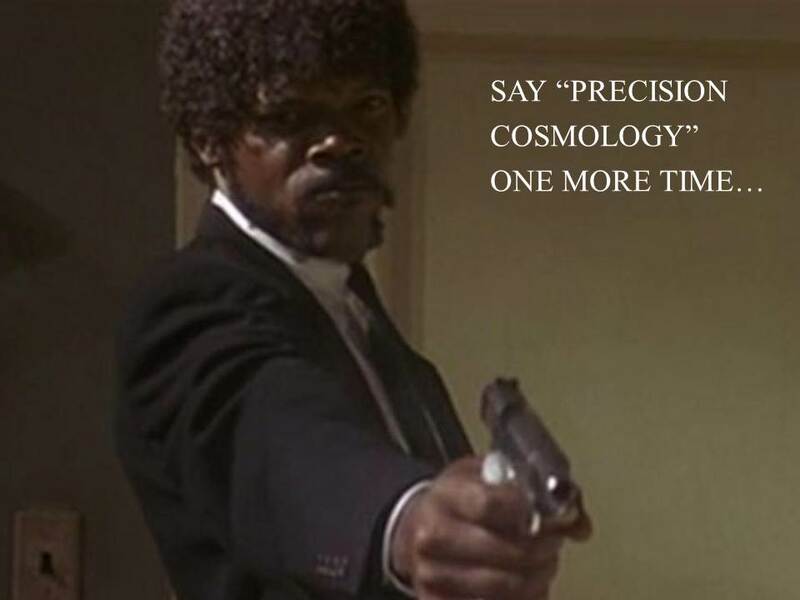 I the talk I tried to explain why I don’t think the standard cosmology is at all boring. In fact, I think it’s only now that we can start to ask the really interesting questions. I did however notice that Josh Frieman (front left) seemed to vote in favour of all the possible options on all the questions. 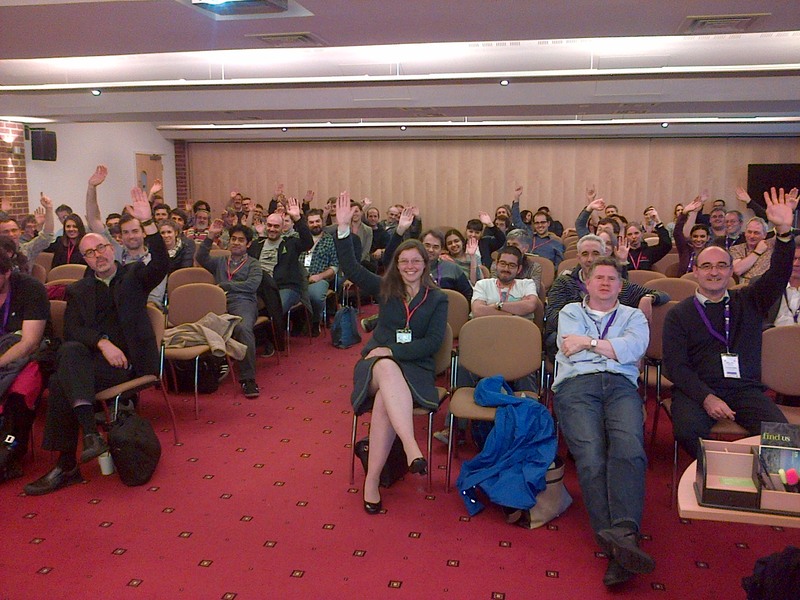 I think that’s taking the multiverse idea a bit too far..
After an extremely busy morning I had the pleasant task this afternoon of talking to the participants of a collaboration meeting of the Dark Energy Survey that’s going on here at Sussex. Now there’s the even more pleasant task in front of me of having drinks and dinner with the crowd. At some point I’ll post the slides of my talk on here, but for the mean time here’s a pretty accurate summary..